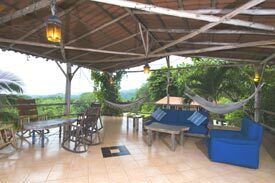 Welcome to Rancho Armadillo Estate, a private estate on 25 acres of rich dry tropical forest in Playas del Coco, Costa Rica. Enjoy your own private paradise! The estate is a perfect retreat for couples, families or groups. When you stay at the estate you have full use of our commercial kitchen, ocean view pool and maid service. We also offer free wireless internet and special golf rates for the Papagayo Golf & Country Club. We are not just a Bed & Breakfast, we are not just a Resort, we are not really even just a Hotel. We are a combination of all three and so much more. Here at Rancho Armadillo Estate we go out of our way to make sure we are more than just a bed and breakfast, more than just a resort, and more than just a hotel. We create an atmosphere so that our guests feel like they're coming to visit friends who have a really nice place to stay. From your first contact with us we will assist you in planning your entire stay in Costa Rica, not just your Rancho Armadillo Estate portion of your trip. Costa Rica has so much to offer and we want to help you see as much of it as possible and we are confident the highlight of your trip will be your stay with us. From the responses we are getting we're succeeding. Don't take our word for this, just go to our testimony page and email any of our past guests and ask them. Thanks to all of our new friends for making Rancho Armadillo what it is. We are proud members of "Adventure Hotels of Costa Rica" please visit our Recommended Hotels Page to access links to the other hotel members. 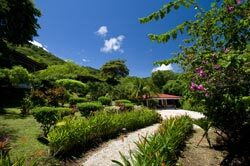 Rancho Armadillo has been Chosen as One of the Top Honeymoon Destinations In Guanacaste, Costa Rica By Brides Magazine!! We were featured in the July '07 issue in the Honeymoon Section of Brides Magazine as one of (if not the) best honeymoon destinations in the top tourist area of Costa Rica. So whether it's your first, second or third honeymoon - stay at Rancho Armadillo and see why we are the #1 choice of all the major Guide Books, Trip Advisor and now Brides Magazine. "SLEEPING WITH THE TOUCANS: 100 GREAT PLACES TO STAY IN COSTA RICA"